At Level 1, people with needs and hopes work together with other people with needs and hopes; people with new ideas work together with other people with new ideas, and so on. All collaborations happen within each community. 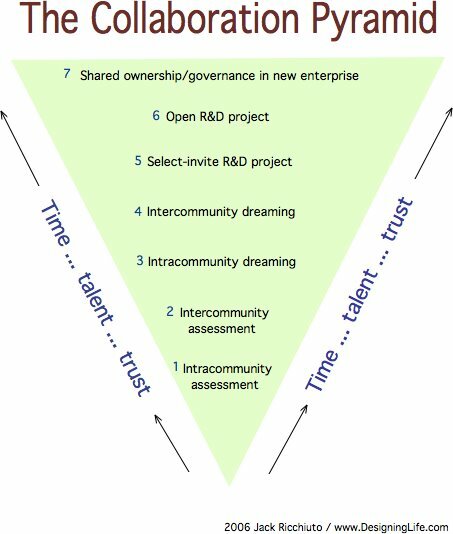 People within communities collaborate in visioning, prioritizing, and planning relative to discovered collaboration opportunities. People across communities collaborate in visioning, prioritizing, and planning relative to discovered collaboration opportunities. 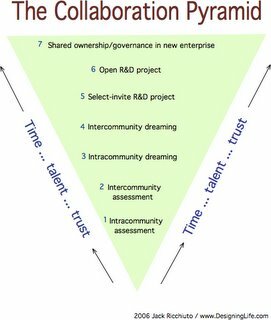 Participants of R&D projects that create a new enterprise share ownership and/or governance. New enterprises include new civic programs, organizations, services.